Hot cocoa is a deliciously warm and comforting drink that I like to serve with lots of little white marshmallows floating on top. Unlike hot chocolate that combines milk with semisweet chocolate, Hot Cocoa starts with good unsweetened cocoa powder combined with sugar and just enough milk or cream to make a smooth paste. Then hot milk (skim, 2%, or whole) is added to this cocoa paste and stirred until it is thoroughly blended. Sometimes I like to place the hot cocoa in a blender (or you can use an immersion blender) to make it nice and foamy. Finish your hot cocoa without a large handful of marshmallows (store bought or homemade) or else a dollop of whipped cream. You may not know it but cocoa powder was invented back in the early 1800s by a Dutchman named Coenraad Van Houten. He made a press that could extract the cocoa butter from the chocolate liquor, leaving a dry cake. This cake was further dried and processed to become unsweetened cocoa powder. Van Houten then went on to discover that if the unsweetened cocoa powder was treated with an alkaline solution it produced a cocoa powder that was darker in color and softer in flavor than what he began with. It became known as 'Dutch-processed' cocoa powder. The reason I tell this story is Dutch-processed cocoa powder is what I use to make my hot cocoa. While you could use regular unsweetened cocoa powder I find the flavor of Dutch-processed makes for a mild yet flavorful drink. Droste is the brand I use and you can sometimes find it in grocery stores, or else at specialty food stores or on line. Hot Cocoa: Place the milk in a small saucepan over medium heat until it is nice and hot. 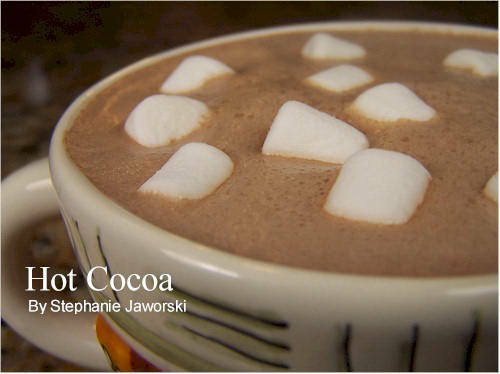 Meanwhile in your mug or cup, make a paste with the cocoa powder, sugar, and cream. Pour the hot milk into the cocoa paste and stir until combined and smooth. You can place the hot cocoa in your blender (or use an immersion blender) to make it nice and foamy. Garnish with marshmallows or softly whipped cream. Makes 1 - 8 ounce (240 ml) serving. Preparation time 15 minutes. Bigelow, Fran. 'Pure Chocolate'. New York: Broadway Books. : 2004. Bloom, Carole, 'All About Chocolate'. New York: MacMillan, Inc.: 1998. Rinzler, Carol Ann. 'The Book of Chocolate'. New York: St. Martin's Press, 1977.